A short story of approximately 3000 words. We make decisions on where to spend our money based on the reviews of others. A history of bad experiences related by others can scare us away from a new store, just as a number of glowing reviews can sway us to try a new restaurant or shop. But what if this process were reversed? 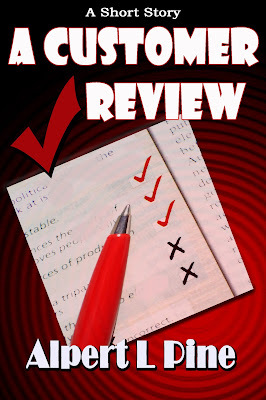 What if it were the businesses and corporations that compiled reviews of customer performance? What if that day you exploded in anger at the mall went into a permanent record, and what if other businesses chose to deny you service due to that one incident? For anyone who has worked in retail, the ability to screen out 'bad customers' may sound like great idea. For the rest of us, it might be a nightmare. Imagine being told that you weren't welcome to shop at your favorite stores any longer. What if the grocery store refused to serve you. Where would get your food? Joe Singwell discovers suddenly one day that he's in a database shared by many of the local businesses. And what they have to say about him isn't good. As he reacts to the situation with anger and frustration, he finds his ranking only suffers more. For everyone who believes that businesses and corporations gather too much data on us; for every retail employee who believes it's time to stop rewarding customers who exhibit bad behavior; here is vision of one potential near future.